Banksy is a pseudonymous British graffiti artist. He is believed to be a native of Yate, South Gloucestershire, near Bristol and to have been born in 1974, but there is substantial public uncertainty about his identity and personal and biographical details. 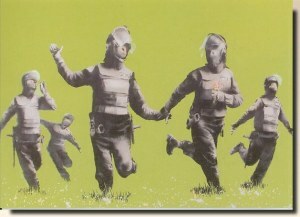 According to Tristan Manco, Banksy "was born in 1974 and raised in Bristol, England. The son of a photocopier technician, he trained as a butcher but became involved in graffiti during the great Bristol aerosol boom of the late 1980s." His artworks are often satirical pieces of art on topics such as politics, culture, and ethics. His street art, which combines graffiti writing with a distinctive stencilling technique, is similar to Blek le Rat, who began to work with stencils in 1981 in Paris and members of the anarcho-punk band Crass who maintained a graffiti stencil campaign on the London Tube System in the late 1970s and early 1980s. His art has appeared in cities around the world. Banksy's work was born out of the Bristol underground scene which involved collaborations between artists and musicians [wikipedia].